The Graduate School seeks to create a more diverse graduate student body at the University of Georgia (UGA) by promoting opportunities in graduate education to all populations. The UGA Graduate Feeder program provides a supportive transition for undergraduate students as they learn about applying to graduate school and as they begin to assume the role of a graduate student at UGA. Prospective graduate students from these institutions will have the opportunity to participate in all of our Pathways programs, including Preparing Diverse Populations for Graduate Admissions, which is targeted to college juniors, our annual three-day Future Scholars Visitation Program, and the Gateway to Graduate School Bridge Program. 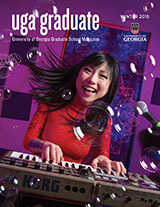 Benefits of participation in the UGA Graduate Feeder program include an application fee waiver for the University of Georgia Graduate School and consideration for a graduate school assistantship if admitted to the University of Georgia. The assistantship includes reduced tuition (to $25), a monthly stipend, and a strong peer mentorship component. Students interested in the UGA Graduate Feeder program must be nominated by a key representative at their home institution. In order to be considered for the assistantship, students must submit a completed application to the Graduate School by January 1. To learn more about the nomination process for this program, please contact Office of Recruitment & Diversity Initiatives.